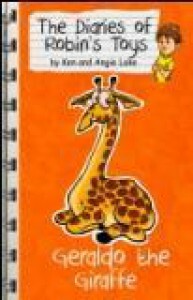 "I had learned a valuable lesson and never wanted to eat so much again"
Well, 'Giraldo the Giraffe' is a great children book. Yes, it is funny, smiley but it is also really instructive and that's important! The book tells a story about bullism and weight problems. Will Robin, his grandad and Giraldo help Caroline, a classmate of Robin? Thank to Ken and Angie Lake for this great lesson! Ps: While you were reading, you probably noticed my terrible grammar! D: Aargh, I' m sorry!